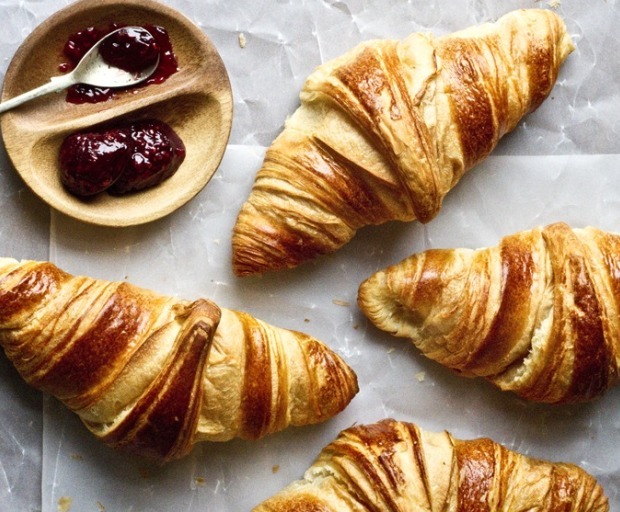 If you think you can resist a homemade, French-style croissant, then you’re just lying to yourself! Rather than buying a pack of six from the local supermarket, create them at home from scratch – did we mention it only takes 30 minutes once the dough is complete? Combine the flour and yeast into a cup of warm water and let it begin to froth in a warm place. Whisk the egg, milk, sugar, cream, and salt in a medium sized bowl. Add the yeast mixture afterwards. Combine the cubed butter into the bowl and transfer to a flat surface. Knead until all of the ingredients have combined. Fold the dough in thirds, then refrigerate for 30 minutes. Once the dough is ready, cut into quarters, then again into 2 triangles. Roll them into the shape of a croissant and place onto a tray with baking paper. Brush the croissants with an egg white and bake for 30 minutes at 180ºC (400ºF). Did you know that the first mention of French toast was in the 14th century? This traditional French delicacy is soaked in a bowl of milk and eggs, then fried until golden brown. While there are many modern adaptions which include delicious fruits and syrup, we have tracked down the perfect recipe which will become your holy grail! Whisk together the milk, half and half, eggs, honey and salt in a medium-sized bowl. Soak each slice of bread for 10 seconds on each side, and transfer onto a tray. Heat a tablespoon of butter into a flat pan, and cook the toast on both sides until golden brown in colour. For extra crunch and texture, then bake in the oven for an additional 5 minutes. Serve with your favourite scoop of vanilla ice cream, powdered sugar, syrup, and seasoned berries. This rustic tarte Tatin features Granny Smith apples and crisp puff pastry baked in a cast iron pan. It looks so impressive but couldn’t be easier to make – including the homemade caramel. 1. Bring cider to boil in 25cm cast iron frying pan on medium-high heat. Reduce heat to medium; cook 10 minutes or until reduced by half. Stir in sugar; cook 5 minutes or until caramel begins to brown. Stir in butter and molasses until well blended. Carefully place apples, cut sides up, in caramel, packing them tightly. Cook 3 to 5 minutes. 2. Remove from heat. Sprinkle with rubbed sage. Place puff pastry over apples, carefully tucking sides in. 3. Bake in preheated 200ºC oven 20 to 25 minutes or until puff pastry is golden brown. Cool on wire rack 5 minutes. 4. For the Fried Sage Leaves garnish, heat oil in small saucepan on medium-high heat. Fry 4 to 6 sage leaves at a time for 3 seconds or until crisp. Drain on paper towels. 5. Run a small knife around inside edge of frying pan. Place a serving platter over Frying pan. Using pot holders, quickly flip over frying pan and platter. Remove Frying pan. Apples should be on top and the puff pastry forming the crust. Cool to room temperature. Garnish with Fried Sage Leaves, and serve with cream, if desired. 4 teaspoons molasses until well blended. Add 3 apples, peeled, cored and halved; cook and stir 5 minutes. Pour caramel and apples into cake pan. 2. Arrange apples in single layer with cut sides up. Sprinkle with rubbed sage. Place puff pastry over apples, carefully tucking sides in. 3. Place in preheated 375°F oven. Reduce oven temperature to 350°F. Bake 45 to 50 minutes or until puff pastry is golden brown. Continue as directed. What’s your favourite French dessert recipe? This classic French salad is packed with healthy ingredients, but is hearty enough for a filling dinner. Use Italian tuna in olive oil for the most succulent flavour. 1. Bring a large pot of salted water to the boil. Add potatoes, and cook until tender but still firm, about 15 minutes. Drain and cool. 2. In a large bowl, combine the potatoes, parsley, olives, onion, tuna and green beans. Allow to cool slightly. 3. Toss the greens with the vinaigrette and add to the potato mixture. Garnish with eggs, tomatoes, capers and anchovies. When I was a girl, a roast chicken dinner was a rare treat, enjoyed by our family only once a month. Now we cook chicken in a variety of ways, several times a week, but sometimes I still want roast chicken the way it was — firm to the bite, and tasting so good on its own — you hardly need to do anything but roast it with a little sea salt, pepper and butter or olive oil. I also prefer to have chicken less often and pay a bit extra for a quality organic bird — one that has scratched around and pecked the ground and had some sort of life. This kind of chicken dinner is worth travelling miles for, especially on a Sunday. The French roasting method is to add stock to the baking dish and baste the chicken during the cooking. The chicken may appear pale but miraculously the skin turns a lovely golden brown towards the end and the flesh stays beautifully moist. The potatoes taste good, too, having taken in some of the flavour of the chicken. Preheat the oven to 200°C (400°F). Wipe the cavity of the chicken with a paper towel. Place a little of the butter or oil, the salt, pepper, tarragon or parsley stalks and orange rind inside the chicken cavity. Truss the chicken (see page 96) and rub all over with the remaining butter or oil. 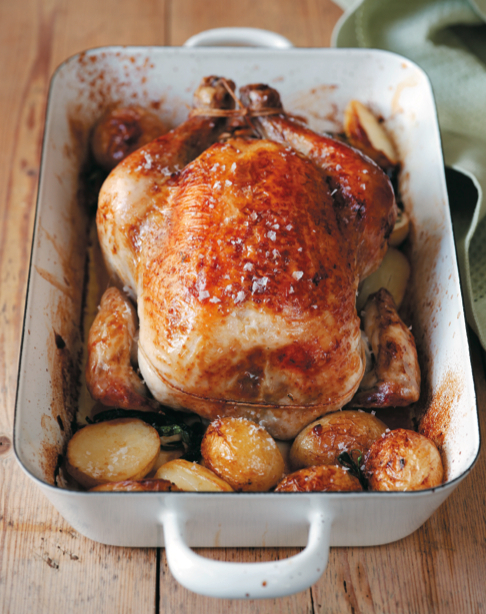 Place the chicken on its side in a baking tray with the stock, preferably on a roasting rack. Add the potatoes to the tray and roast for 20 minutes. Turn the chicken onto the other side, baste with stock and turn the potatoes. Reduce the oven to 190°C (375°F) and continue to cook for another 50 minutes, turning and basting every 15 minutes and adding more stock (or a little water) when necessary. There should be just enough stock to keep the juices in the pan from scorching. Towards the end of cooking add the wine and turn the chicken on its back for the last 15 minutes to brown the breast. Turn the potatoes from time to time. To test if the chicken is cooked, run a fine skewer into the thigh joint. The juice should be clear. Remove the chicken from the dish and discard string. Keep in a warm place. This recipe by Tastes of Burgundy host Annie Smithers is a wonderful combination of crisp, buttery pastry and soft, sweet onions. A dish that can be a delightful entrée or a delicious light lunch. To make pastry, sieve flour and salt. Chop unsalted butter through flour. Make a well in the centre and add water. Carefully bring in flour mixture from the outside until dough comes roughly together. Push dough outwards with the palm of your hand to roughly blend butter – you should be able to see large streaks of butter in the dough. Shape into 2 discs and wrap in plastic film. Refrigerate for 1 hour. Meanwhile, melt butter over a low heat. Add onion to melted butter. Stir until well combined. Cover and cook, stirring often, for 30 minutes or until onion is soft and golden. Season with salt and pepper. Set aside to cool. Whisk egg yolks and cream in a bowl. Add cooled onion and stir until combined. any excess. Place tins onto a baking tray and fill with onion mixture. Bake for 25–30 minutes or until set and light golden on top. To make pea sauce, melt butter in a saucepan over a medium heat. Add onion and cook, stirring, for 3 minutes or until soft. Add peas and stock. Bring to the boil. Reduce heat and simmer for 1–2 minutes or until peas are just tender. Strain peas, reserving liquid. Put peas and 1 cup of reserved liquid into a food processor. Process until smooth, adding more liquid if required. 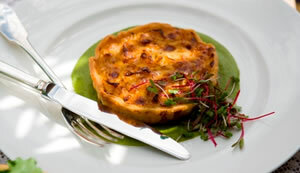 Serve tarts on pea sauce and top with baby chard. For cooking enthusiasts with a penchant for French cuisine and a drop of Pinot Noir or Chardonnay, TASTES OF BURGUNDY is the perfect experience. From May 2011 TASTES OF BURGUNDY will be running cooking schools from that iconic gourmet region of eastern France, La Bourgogne (Burgundy). Home to such world-renowned and typically Burgundian dishes as coq au vin, beef bourguignon and Époisses de Bourgogne cheese, Burgundy is a gourmand’s dream come true. Now Australians have the chance to enroll in a one-week cooking school hosted by one of three well-known chefs: Manu Feildel, Christine Manfield and Annie Smithers. These three popular foodies have signed up to teach two one-week schools each in May, June and July 2011. Each week will include three “cooking days”, involving market visits, menu design, afternoon cooking class and culminating in dinner that evening. The non-cooking days will be packed full of trips and experiences including barrel tastings, visits to local artisan farms, restaurant meals ranging from small bistro to Michelin star, cultural visits, wine tasting and vineyard visits with a farewell degustation dinner at the famous Three Michelin Star restaurant, Lameloise in Chagny. The week is all inclusive from being collected in Le Creusot, seven nights accommodation in a beautiful chateau, cooking classes, cultural visits, transport during the week, all meals, wine, spirits, champagne and the return transfer to Le Creusot for onward travel. Participants must make their own travel arrangements to and from Le Creusot (which is serviced from Paris by the TGV high speed train). Annie Smithers is one of Australia’s best loved chefs and hosts the new culinary travel experience Tastes of Burgundy with Manu Feildel and Christine Manfield. Annie grew up in outer suburban Melbourne and has been cooking professionally for nearly thirty years with some of Australia’s best chefs. Her eponymous restaurant in Kyneton is seen as the catalyst for the re-generation of the popular tourist strip, Piper St, and has been awarded a Good Food Guide Chefs Hat each year since 2006. Two years ago, Annie started a collaboration with well known gardener, Simon Rickard, to turn her home property in Malmsbury into a market garden to supply the restaurant. They selected mainly French heirloom varieties of fruit and vegetables and now supply up to 90% of the restaurants needs. She has a passion for carefully sourced, local, seasonal produce and her cooking style is rooted in European traditions with some quirky Australian twists, which translate from the restaurant kitchen to the home with ease. You can whip up this easy French dessert after dinner or for Sunday lunch – it tastes just like a French patisserie. 1. Mix the flour, sugar and salt together in a mixing bowl and rub the butter into the flour. The mixture should resemble breadcrumbs. 2. Mix together the vanilla, egg yolks and water and add to flour mixture. Knead together to a smooth dough. Wrap in plastic film and refrigerate for at least 30 minutes. 3. Lightly grease a 24 cm flan dish. Preheat the oven to 200°C for a conventional oven or 180°C for a convection oven. 4. Roll out the pastry on a lightly floured board to 3 mm thickness, so it is slightly larger than the 24 cm flan dish. Carefully line the flan dish and trim off excess pastry. 5. 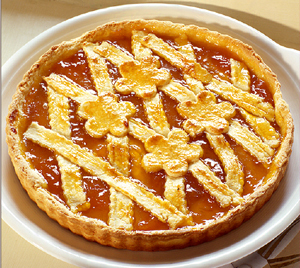 Spread the apricot conserve over the base of the flan. Decorate the top with pastry off-cuts. 6. Reduce the oven temperature to 180°C for conventional oven or 160°C for convection oven. Place in the oven and bake for 20-30 minutes or until pastry is golden brown. Allow to cool before serving.